Most days are “one of those days.” From the moment the feet hit the floor to the time where they come back under the covers at night. Busy. The last few days have been kind of crazy simply because Frank’s been working doubles back-to-back, two days in a row. I’ve been the sole taxi driver, chef, planner, cleaner, laundry maid… and everything else being the only one at home entails. Yesterday, thankfully was my day to work at home. It was busy, but I was able to get more done around the house, which always helps. Today was an office day. Feet hit floor and the frantic morning dance begins. The twins are usually gone to school by the time I need the bathroom, but I still share it with Dante and Carlito. It is a popular place in a 1-bathroom home, as you can imagine. Beyond getting myself ready, I remembered that last night I put some black beans (slightly expired ones, so I’m hoping they will turn out fine) in to soak, preparing them for a day of the crock pot. This morning, as I went to attend to them, I realized I hadn’t had breakfast, hadn’t packed a lunch (for myself). That trumped the beans since an angry stomach doesn’t go well with a day of work. And, I was determined NOT to go to McDonald’s for breakfast. Two reasons: body and budget. McDonald’s would mean oatmeal and coffee. It would mean money I didn’t need to spend. It would mean, also, sacrificing my calories (I’m trying to get back under control again) on something I didn’t want to sacrifice them on. Frantic, I made up a sandwich, wrapped it sloppily, grabbed a peach and headed out the door. No time for coffee; I would have to stop. At. McDonald’s. I did and was tempted by the oatmeal. Restraint. Self-control. I slowly counted out change from the ashtray (I keep my pens and change in there), grabbed a medium coffee and a glass of ice water (which fits perfectly in my water bottle). Battle won, my temptation was not over. On the way home from work. Once again. Tempted. See, I drive right past the crack house that is McDonald’s. I know how many calories the salads have, and desperately wanted the ease of not having to make my own. Grumbling, I went into the grocery store instead. Bread, milk and a container of Organic Girl 50/50 in tow, I head home. I am already anticipating the salad I will make, since I had a fabulous one last night. Here it is, crappy phone picture and all. But you get the gist. I think there are 2 servings in that container, but I made it into 1. 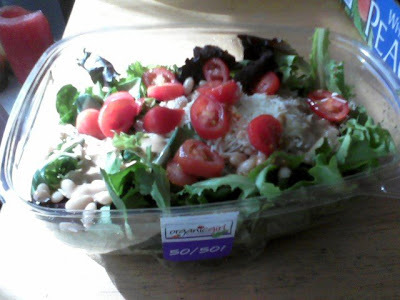 I added 1/4 cup of navy beans (soaked and cooked a couple days ago – tossed them with some salt and pepper first), 1/4 cup shredded parmesan/romano mix, some cherry tomatoes, and topped it off with Simply Dressed balsamic dressing (my new favorite). So. Dang. Good. I think my pants are going to split, but I got my greens in. Much better than a McDonald’s salad, if you ask me. Good for you-resisting the siren lure of McDonalds! Although your choices would have been much better than mine, I do enjoy their breakfast biscuits. I also have to pass a McDonalds on the way to work – my choice would always be a sausage and egg mcmuffin so I would count the oatmeal as a score!